As the number of billionaires around the world increases, it’s helpful to understand how global business trends are affected by these people and the sources of their wealth. In a recent New York Times article entitled “Where the Big Money Is,” Juan Velasco and Paul Sullivan explored today’s billionaires around the world through statistics. The infographics in the article present research by Wealth-X, which uses a database of regularly updated information on high net worth individuals. Four of the top five billionaires in the world are American. Bill Gates leads the pack at $89.3B, while the other top billionaires include household names such as Warren E. Buffett (#2, $73.5B), Jeff Bezos (#4, $68B) and Mark Zuckerberg (#5, $50.7B). 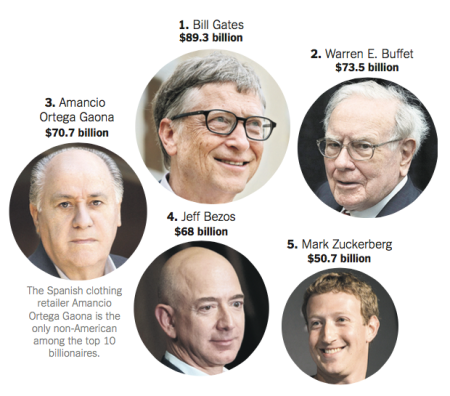 The only non-American in the top 10 billionaires is Spanish clothing retailer Amancio Ortega Gaona (#3, $70.7B). Europe has the most billionaires of any region. With 806 billionaires, Europe is far and away #1 on this list. After Asia (645) and North America (628), there is a much lower concentration of ultra high net worth individuals in other regions: Middle East (166), Latin America & Caribbean (154), Africa (41), and Pacific (33). The city with the most billionaires is New York City. “The Big Apple” is home to 97 billionaires — followed by Hong Kong (79), Moscow (74), London (68), Beijing (38), Singapore (37), Sao Paulo, Brazil (36), Dubai (35), Istanbul (32), and Mumbai (31). The world’s 2,473 billionaires had a combined wealth of $7.7 trillion in 2015. For context, the U.S. GDP (Gross Domestic Product) was approximately $17.9 trillion in 2015, and China’s GDP was about $11 trillion. If the world’s billionaires were a country, they would come in third after those two nations. The most common industry for billionaires is finance/banking/investments. The wealth of 377 billionaires comes from the finance/banking/investment industry, followed by: industrial conglomerates (317), real estate (141), nonprofit and social organizations (122), manufacturing (120), technology (114), textile, apparel and luxury goods (111), food products (103), and various other industries (1,068). There are 8.1 male billionaires for every 1 female billionaire. The majority of male billionaires are self-made, while the majority of female billionaires inherited their wealth. 60.5% of male billionaires are self-made — while 29.1% of them have a combination of inherited and self-made wealth, and 10.4% inherited their fortune. When it comes to female billionaires, 16.5% are self-made, 27.5% have a combination of inherited and self-made wealth, and 56% inherited their money. The average ages of billionaires are 63.2 for men and 62.2 for women. The most common interest among billionaires is philanthropy. While philanthropy tops the list of billionaires’ interests and hobbies at 56.3%, others include: travel (31%), art (28.7%), fashion and style (25.2%), politics (22.2%), wine and spirits (15.9%), boating (14.9%), health and exercise (14.8%), automobiles (14.5%), collectibles (14.1%), football/soccer (13.1%), reading (12.3%), cultural events (12.1%), golf (11%), and dining (10.9%). These ultra-high net worth individuals play a major role in the luxury real estate market, so knowing as much as possible about them is essential for real estate professionals who serve affluent clientele. Living in “The Information Age” makes it easier to understand client needs and build successful relationships with them. Institute members have access to Online Wealth Lookup and WealthEngine’s Prospecting Tool to assist them in learning more about the affluent buyers and sellers in their luxury markets.